I used my Nikon F2 with a 50mm f/1.4 Nikkor lens on Ilford Delta 400 Film. The physical print is 8"x10". Last week I again visited the Huntley Grease Factory. It's become a favorite location of mine for shooting and exploration. This print depicts the large double doors leading into the boiler room of the main building. 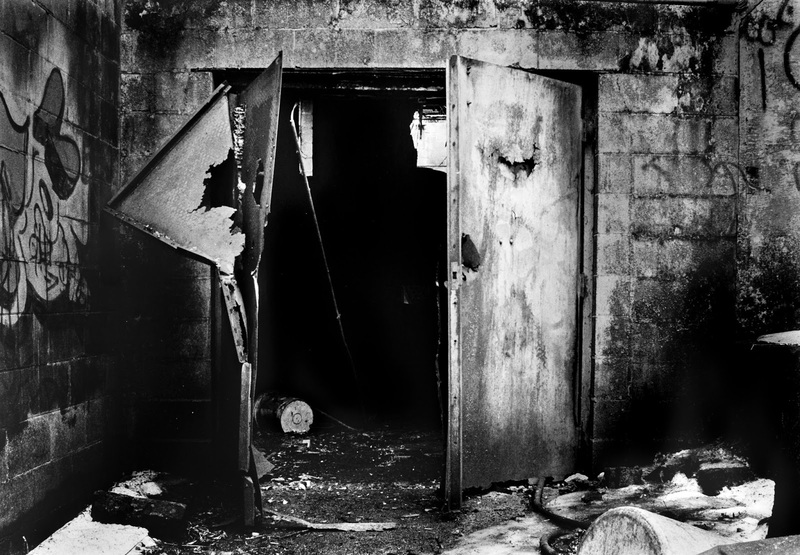 Though they were once located in the interior, many of the walls have fallen over time, and these doors now act as the main entrance into the factory. Stepping through this grand entrance is a feat of courage: you never know what is lurking in the darkness within. 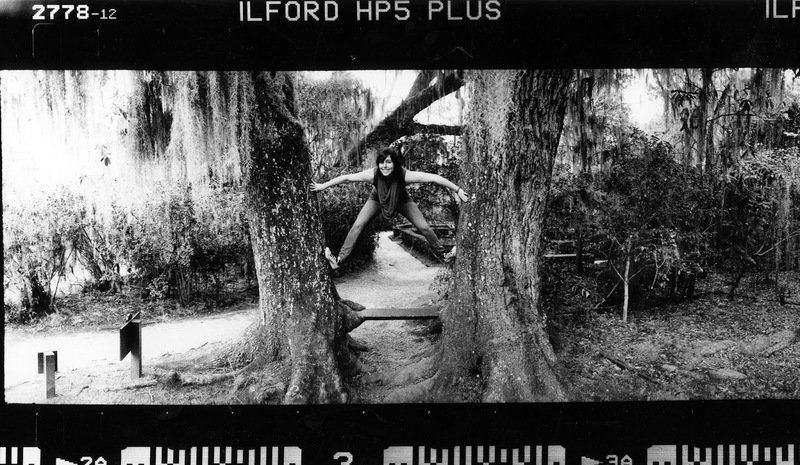 For this print I used my Nikon F2 with a 35mm F/2 Nikkor, on Ilford Delta 400 film. The physical darkroom print is 9"x13.5". During my sophomore year of college, I inherited my family's 1993 Chrysler Town & Country minivan. It has over 175,000 miles on it, and is most likely nearing the end of its life. Having grown up with my van, it holds a lot of sentimental value. If you ever read this blog, you know that my van is the subject of many of my test shots with new film cameras I acquire. Being so special to me, I decided my van is deserving of more serious work based on it. 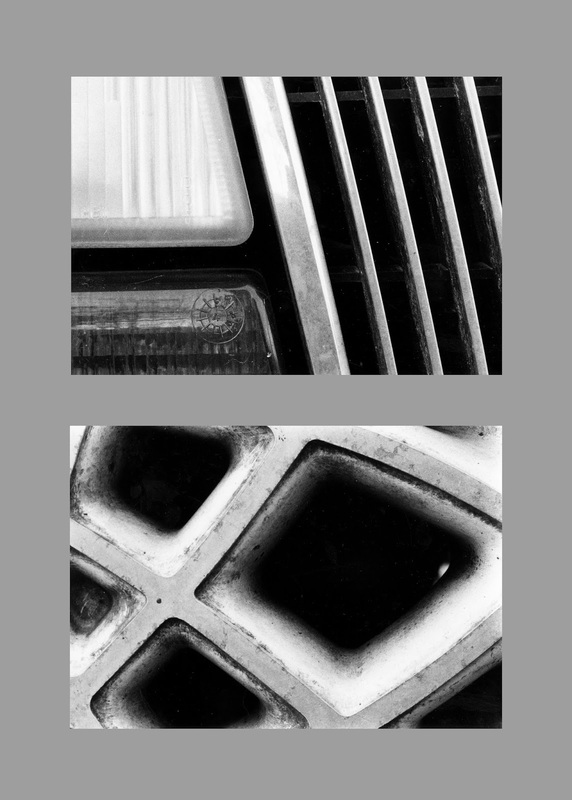 This abstraction diptych shows the aged, yet elegant geometric forms of my Town & Country. 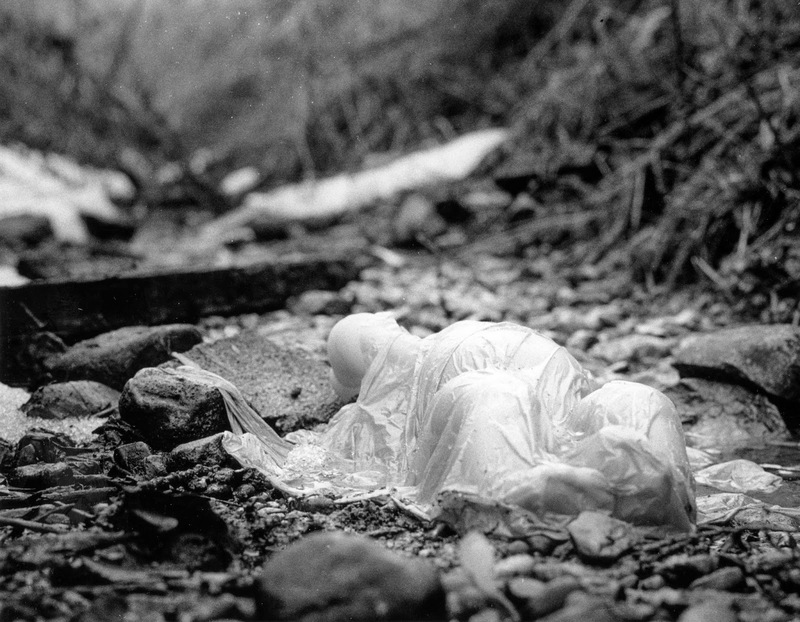 These images were made using my Nikon F with a 50mm F/3.5 macro Nikkor, on Ilford HP5+ film. The physical prints are each 5x7 inches. I hope to make more prints in the future showing off more geometric forms, as well as organic forms (rust, cracks, etc). Thanks for looking! While in Charleston, we visited the beautiful Magnolia Plantation. 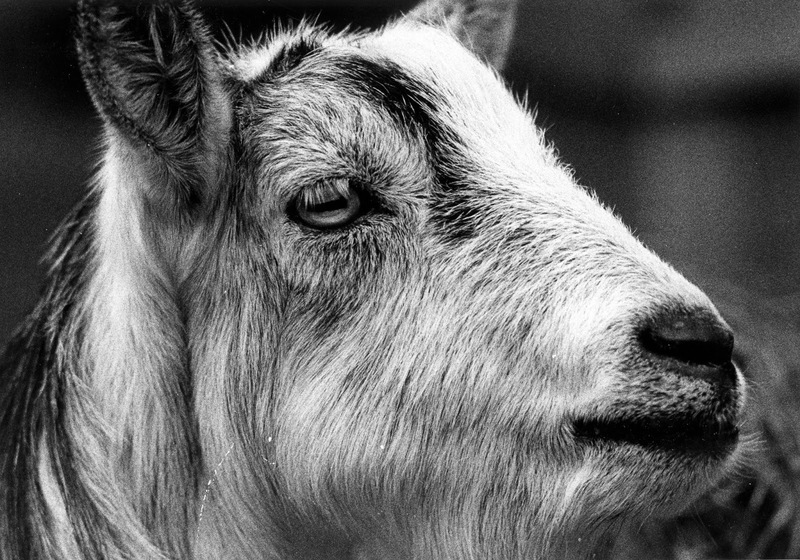 The Magnolia Plantation features acres of gardens, swamps, and... goats? I met this charming guy at the plantation's petting zoo. He was nice enough to pose for me! I used my Nikon F with a 105mm F/2.5 Nikkor lens on Ilford HP5+ film. The physical print is 5x7 inches. I made this photograph in downtown Charleston during our trip last month. I used my Widelux F7 with Ilford HP5+ film. The physical print is 5.5 x 13.5 inches. I burned the corners of the print to create emphasis on the subject. I think the panoramic view of the Widelux does a nice job of giving the photograph a sense of place. 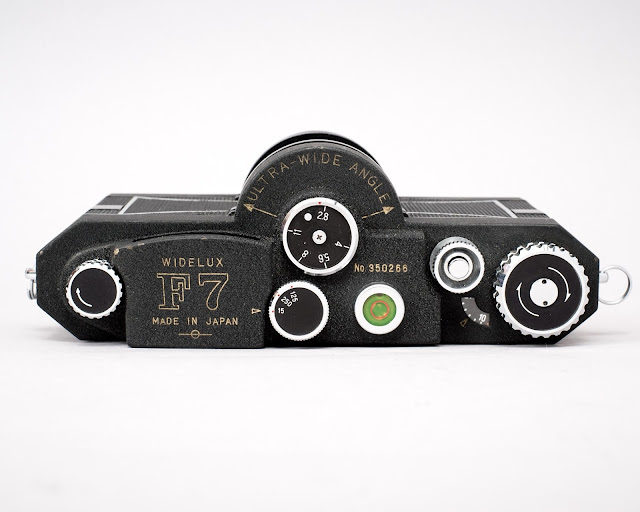 First introduced in 1975 by Panon Camera Shoko Company, the Widelux F7 35mm panoramic camera is a thing of beauty. Through the use of a rotating 26mm F/2.8 lens, the F7 is capable of capturing a breathtaking 140 degree angle of view. The Widelux is capable of making fantastic images, but it takes a bit of practice. At first, the camera can seem pretty limiting. 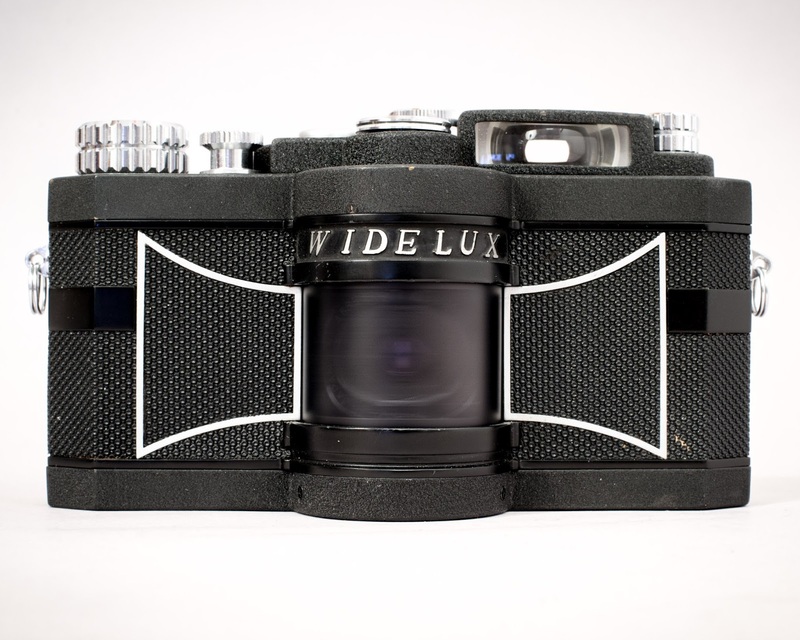 The Widelux F7 has only three shutter speeds (1/15th, 1/125th, 1/250th), and an aperture range of F/2.8 to F/11. This limited range of stops makes it difficult to shoot with in very bright light, as well as in dim light. One of the most maddening features of the Widelux is that it has a fixed focus lens. Yup, adjusting the focus point is impossible. The 26mm lens is forever focused at 10 feet, and the only method of "focusing" is by adjusting the aperture to increase or decrease the depth-of-field. Even with the large depth-of-field of a 26mm lens, it is very possible to miss your focus at F/2.8 and F/4. The plus side of the fixed-lens deal is that from F/5.6 to F/11, you don't have to think about focus as long as your subject is more than 4 feet away from you or so. Just shoot away! Top View. Notice the cool green level! The Widelux demands a certain kind of grip. You have to keep you fingers far away from the rotating lens, or they'll show up as nice out-of-focus blobs in your final photograph. Try to keep your fingers on the top and bottom of the camera, and away from the front plate. You'll get used to it in no time. Being a panoramic camera, the Widelux's negatives are much wider than normal. Standard negatives are 24x36mm, while Widelux negatives are 24x59mm. This being so, you get less shots on a roll of film. A 24-exposure roll will typically get you 14 exposures on a Widelux. A roll of 36 usually gives you 20 shots. One other thing to note is that the viewfinder does not show you even close to the entire field of view. You'll get much more information in the final negative than what the viewfinder shows you. I plan on doing some tests in the near future to find out exactly how much (or how little) the viewfinder actually shows. After a few rolls, you start to get used to the camera's quirks and limitations, and you can enjoy the Widelux for what it is: A sweet panoramic camera. The Widelux makes photography feel new again. Shooting with the "Lux" is a completely different experience than shooting with any other camera. One of the greatest parts about the Widelux is that no one knows what it is. This fact, along with the ultra-wide angle of view, makes capturing candid photographs much easier and less stressful than with a "normal" film camera. You don't have to have the camera directly facing your subject in order to get them on film!